Within the contexts of debates on economic and social sustainability and of a sociology and cultural studies that increasingly explore things in their relation to social processes, design research is focusing more and more on the social dimensions of product design. While these debates are taking more of a macrosociological perspective, this conference is less concerned with such topics as the role of things in society as a whole, or how things initiate entire milieus and social mass phenomena, or investigating the source of social contexts, than with asking a micro-sociological question that is more moderate and more concrete: how things structure and constitute interpersonal relationships. How do things shape and regulate relationships? To what extent are they part of the sociality of human beings and support their sociability? By addressing sociality and sociability through things, the conference aims to put a narrower focus on the topic “social design”. Within the design discourse “social design” is often used in a colloquial sense, whereby “social design” either has as its object the welfare of certain groups, or concentrates on the design of intangible relationship structures and behaviour patterns in terms of services. While the former approach understands “social design” as ethically oriented or charitable design – and therefore includes far more than just the social dimensions of things (Papanek’s “Design for the Real World”, Human Centred Design, Universal Design) – the latter approach follows the notion that the social aspect can be found solely beyond the world of things, making the social dimensions of things become obsolete as an issue. Unlike this common understanding of “social design”, the conference investigates the active role of things in the shaping and constitution of social relations. To what extent do they have a share in the sociality of human beings and support their sociability? While the concept of “sociality” rather refers to the dependence of the subject on social structures, the term “sociability” refers more to the ability of subjects to establish social relationships. How does the constitution of things thus stabilize interpersonal relationships (sociality) and enable their formation (sociability)? In order to diversify the topic of the conference as broadly as possible, the conference sets three theoretical focal points that are nevertheless interwoven with each other in practice: communicative, aesthetic and performative sociality and sociability through things. This structure reflects three competencies, which are relevant for the sociability of subjects, in other words the ability to constitute social relations: 1. the cognitive ability of interpersonal cognition, 2. the perceptual or emotional ability of interpersonal experience, 3. the performative ability of interpersonal acts (see Paul Ekman’s distinction between “cognitive empathy”, “emotional empathy” and “compassionate empathy” that leads to social action). Since social relations always take place in a tangible world, the question arises as to how things co-constitute and mediate interpersonal cognition, experience and action. In the second half of the twentieth century the social efficacy of products was debated under semantic and wider linguistic aspects (Baudrillard, Barthes, the Offenbacher Approach based on a product language). Products have the function here of symbolizing social affiliations and differences. This focus questions how things intervene in cognitive sociability, enable or disable interpersonal knowledge, thus what role they play for the communicative aspect of social relations. II. Performative relationShips More recently an approach has been established with the Actor-Network-Theory (Latour et al. ), which seems particularly suitable for considering the performative role of things within social relations. This approach is methodologically useful, because it does not make a preliminary decision about the entities that need to be taken into account for understanding social processes. The conference aspires to take on the performative and objectoriented focus of the ANT, but does not require networks of any type, apart from those that apply to the constitution of human relationships. How do things change our acting, interpersonal relationships? How do they enable or disable the competence of performative sociability? How do things regulate interpersonal behaviour? And might this starting point even be suitable for generating a concept of Interaction Design that deals not so much with the interactive relationship of people to things as the interpersonal interactions with and through things? This focus is based on the assumption that not only a cognitive interest but also a perceptive interest is important for the constitution of social relations. Although the design discourse rarely distinguishes between symbolic and 4 aesthetic aspects of things, this focus emphatically requires product aesthetics based on social relationships. The theory of an event society (Gerhard Schulze “Erlebnisgesellschaft”) diagnoses a general orientation towards experience – can this be completed and expanded to include concrete contents of experience: for example the question whether things play a role in the awareness of our fellow subjects? How do things engage with our perception and experience of interpersonal relationships, how do they enable or disable the competence of perceptual-emotional sociability? 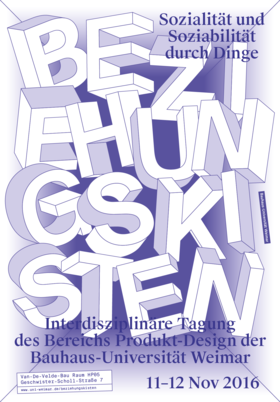 The interdisciplinary Conference of the Department of Product Design, Bauhaus-University Weimar* on November 11–12 (2016) is open to the public. Free entrance! Herbert Fitzek: Dinge sind asozial!? Judith Seng: Choreografien des Alltags – oder kann die Gestaltungsdisziplin von den performativen Künsten lernen? This entry was posted in Conference, design research, designwissenschaft and tagged Adam Drazin, albena Yaneva, Alexander Hagner, anamaria Depner, Annette Geiger, bauhaus, design, dinge, Herbert Fitzek, Johannes lang, Judith Seng, Kathrina Dankl, konferenz, Martina Fineder, moritz ebeling, Peter-Paul Verbeek, soziabilitiät, weimar, Wolfgang Sattler. Bookmark the permalink.